Bread and cheese. The two just go together like Frick and Frack. I don’t think I’ve ever seen a cheese plate served without some sort of bread, be it crackers or a sliced baguette; and there’s very little you can do to improve the taste of a fine piece of bread, other than spread it generously with a bit of your favorite cheese. Though I’ve featured a few cheese-laden breads here and there, I’ve not devoted an entire week to them, and it’s high time I rectified that situation. This week, I’ll be making all sorts of breads that involve cheese, from fast and easy breads to more elaborate concoctions, both sweet and savory. Today’s bread was recently featured in Bon Appétit magazine, and comes from the capable hands of Peter Reinhart. Although the method seems long and a bit convoluted, it’s really quite straightforward (and I’ve included step-by-step pictures to help). A quickly-made buttermilk biscuit dough gets rolled and folded with sharp cheddar cheese and herbs, resulting in gorgeously flaky bites of full-flavored goodness. The cheese here affects the texture two ways: first, by creating a fantastically tender interior, due to its relatively high fat content, and second, by melting into an addicting crispness on the outside edges. The sharp nuttiness it provides is the icing on the cake; paired with the freshness of herbs, it makes for one fantastic biscuit. 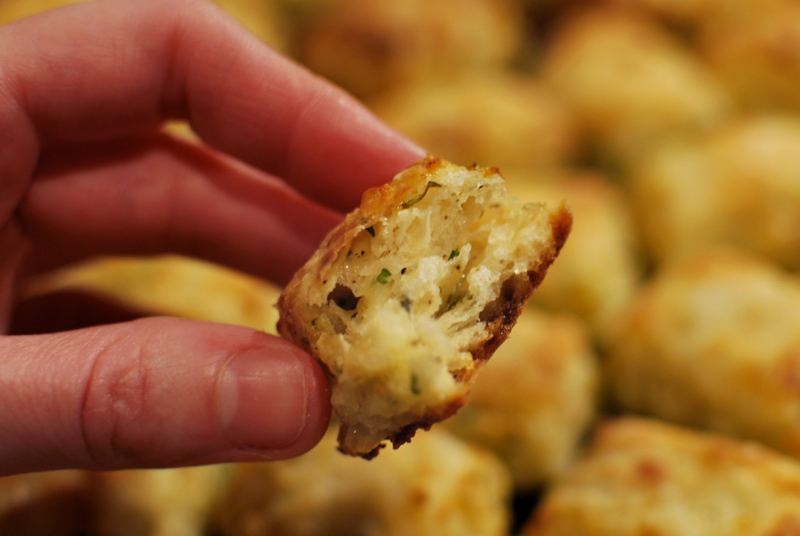 I’ve cut these biscuits into very small pieces, about 1 by 2 inches, which maximizes the crunchy exterior. If you prefer more soft interior, just leave them a bit bigger, even twice the size. But no matter how you cut them, and despite the large batch size, make sure to save yourself a couple before they vanish from the cooling rack. And trust me, they will vanish. 1. Line 2 large rimmed baking sheets with parchment paper. In a medium bowl, mix cheese, parsley, herbes de Provence, and pepper until combined. 2. In a large bowl, whisk together the flour, baking powder, sugar, salt, and baking soda. Using a coarse grater, grate the frozen butter into the flour mixture. Toss gently with fingertips until evenly distributed. Gently and quickly, stir in the buttermilk until just incorporated. The dough will be very sticky. 3. Sprinkle a clean work surface with 1/4 cup flour. 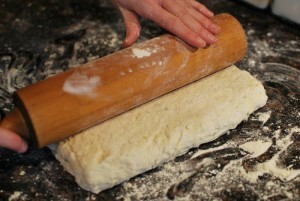 Scrape the dough onto the work surface, and sprinkle the top of the dough liberally with flour. 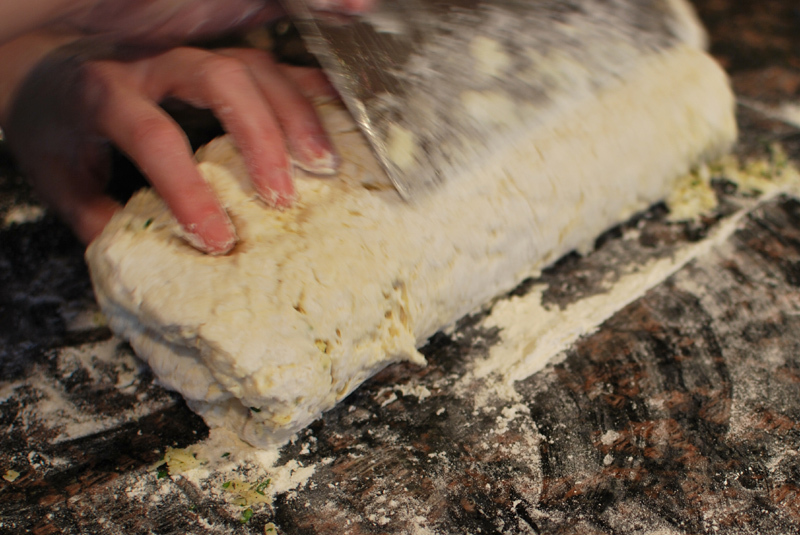 Using your hands, press the dough into a roughly 8 inch square, about 1/2 inch thick. When needed, sprinkle with additional flour to prevent sticking. 4. Spread 1/2 cup of the cheese mixture over 2/3 of the surface of the dough. Fold the dough into thirds as you would fold a letter, using a bench scraper to help if necessary: lift and fold the uncovered 1/3 over half of the cheese-covered portion. Then lift and fold the folded portion over the remaining cheese-covered portion, still using the bench scraper to help as necessary. You should end up with a long rectangle shape. 5. 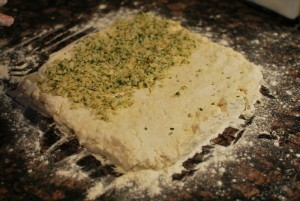 Sprinkle the dough with flour to prevent sticking. Again, press the dough out to an 8 inch square. 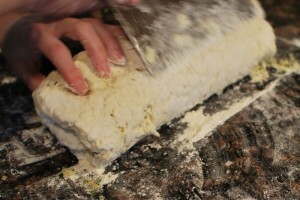 Spread another 1/2 cup of the cheese mixture over 2/3 of dough, and repeat the folding process. 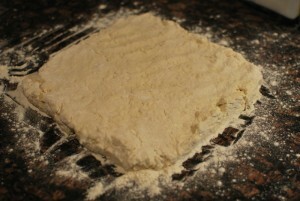 Again, press the dough out to an 8 inch square. 6. 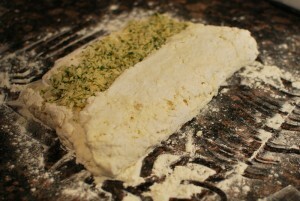 Repeat the folding and pressing 2 more times with the dough and remaining cheese-herb mixture, for a total of 4 times. After the final folding, roll out the dough with a rolling pin to a roughly 10 inch square, about 1/2 inch thick. Cut the dough with a bench scraper or round pastry (or pizza) cutter into about fifty 1 x 2 inch pieces. 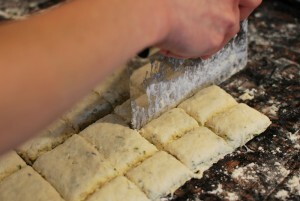 Place the biscuits on the prepared baking sheets. If your kitchen is hot, place the pans in the refrigerator to chill while preheating the oven to 500º F. Position a rack in the center of the oven. 7. Bake the biscuits, 1 sheet at a time, at 500º F until just golden on top, about 10 to 15 minutes. Cool biscuits on the baking sheet at least 5 minutes. If desired, cool completely on a wire rack, then rewarm in a 400º F oven for 3 minutes. 1. I used white cheddar, but feel free to use white or yellow as you prefer. 2. This recipe calls for fresh parsley, as it loses much of its flavor when dried. Instead of the herbes de Provence, feel free to use any mixture of dried or minced fresh herbs you like. 3. To prepare these biscuits for the freezer, after cutting them out, place the biscuits in a single layer on the prepared baking sheets. Freeze until firm, then wrap in a single layer in foil and enclose in plastic zip top freezer bags. Biscuits may be frozen up to 2 weeks. 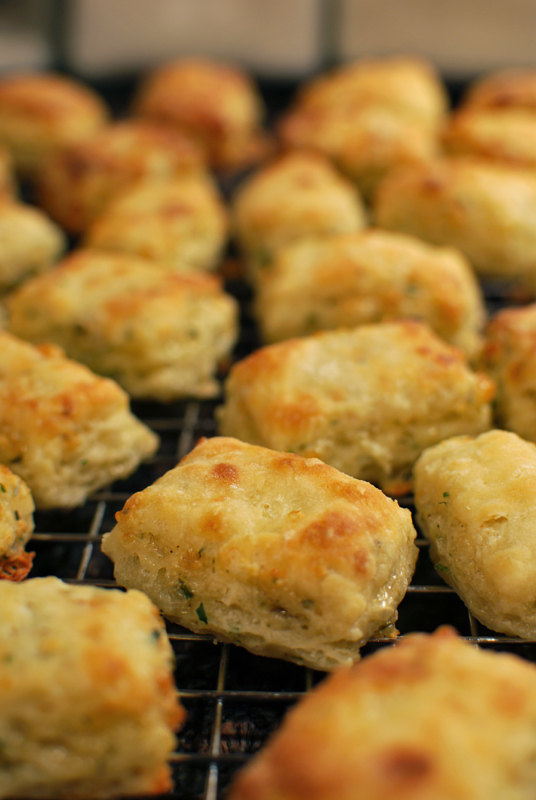 To bake, place frozen biscuits 1 inch apart on parchment-lined baking sheets, and thaw in refrigerator overnight. Let biscuits stand at room temperature 20 minutes before baking as directed. I just picked up more extra sharp cheddar than I need at the moment (but is there ever enough cheese? ), and this was the first thing that came to mind. Can’t wait to try it! Okay, I just made them this morning, and they’re pretty amazing. Thank you so much for posting this with such detail and pictures! Julie: So glad you liked them! I like posting lots of instructional pictures, as I’m a visual person who finds it easiest to follow a series of photos than a bunch of words. Besides, it’s not always easy to write clear directions for some things, no matter how simple the step might seem. Happy baking!